Once upon a time I was a 2nd grade teacher. There was of coarse a time while teaching the littles when I demonstrated how a volcano erupts with the help of vinegar and baking soda. Man the combination of vinegar and baking soda is explosive... Literally!!! When one of the bathroom drains in my house started draining slowly, I decided to do a little science experiment to see if the same dynamite combination of baking soda and vinegar could possibly clean out my drain. I really didn't want to run to the store with my two little kiddos just for Drano, so I was praying it would work. I used about 1/4 a cup of baking soda. I just poured it into the sink. Then I poured enough vinegar into the sink to make it bubble. I let it do it's magic for a few minutes and when I turned the warm water on to rinse the sink clean. It drained liked a dream! No more slow draining, clogged sinks here! I have decided to name this natural Drano duo, the mean green cleaning team. 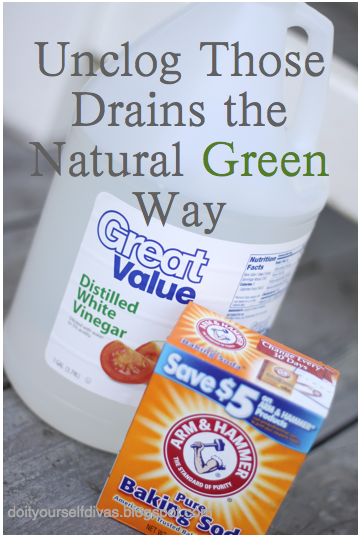 Thank heavens for natural, cheap, green Drano that you can make in your own home! So I tried it ....and it worked!! And if you follow it up with a tea kettle full of boiling water, it's even better. Think of how that hot hot water melts the soap scum & buildup and pushes it through. I do this semi-regularly to keep our drains clear and to kill some of the nasty (odor, especially) that can happen. Here is how old I am. When we were kids, there were NO child proof caps and we would put some baking soda in pill bottles from the pharmacy, then add vinegar and quickly snap the cap on. Wait a few seconds and the cap would go flying! This was the age before Nintendo and this was how we amused ourselves..... I digress..... The true point of the baking soda is that if you use it by itself, it combines with the fats and oils that have accumulated on the sides of the pipes and turned into soap and will slough off. When you add the vinegar, you are merely creating a quick, one time "bang", which is great for a clog. I take my fridge baking soda when I am tossing it out and pour it down all my drains. It "sweetens" the pipes and strips some of the build up as a preventative.